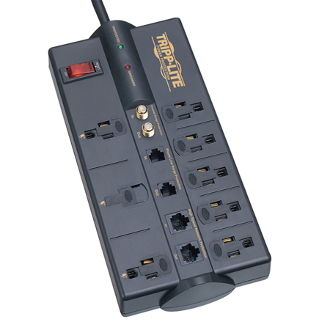 Home and Business Theater Surge Protection Device 8 outlets / 10-ft. cord. 3240 joule rating. Coaxial surge protection (digital broadband quality accommodates 2.2GHz bandwidth). Ethernet surge protection. $250,000 Ultimate Lifetime Insurance. (USA only) 2-line modem/fax surge protection. Listed to UL 1449.